Not too long ago, I put reflective tape on my helmet because, I was told, all that could be seen of my bike in the night was a little red dot. By happenstance rather than design, all of my gear is black and my bike is black. I can't say I mind, as it's a fine color, but visibility is an issue, especially if that lone red dot burns out during a night ride. KapscoMoto's LED tail light, brake light, and license plate bracket all come in one neat little package that provides one bright rear light. The LEDs burn red behind a clear case as you ride and get brighter as you brake. Being LEDs, the lights are highly visible and have an estimated 100,000 hour lifespan. That equates to 6 million miles if you're averaging 60 mph, so you'll probably never have to think about your tail light again. A universal fit permits you to bolt this on to any bike, be it standard or metric. 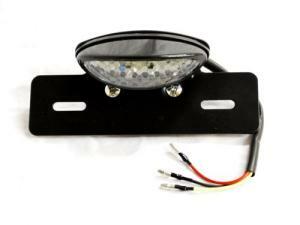 You can strip down your rear end with this compact combination of a tail light and a bare-bones license plate bracket. The studs on the light itself are 3.25 inches apart and the bracket studs are 2 inches apart. The wiring is straightforward and should not confound. This won't do you much good if you have a nice license plate frame, but if you've decided this is right for you, it will cost you anywhere from $30 to $50. The price makes it something you should check around about, because LEDs are not new or hard to find technology. i recently purchased and installed the motorcycle cat eye led tail light turn signal combo.after having it connected and working the license plate leds quit working after about 4 hours riding time.all connections checked good.the unit it self is faulty.i emailed kapscomoto and got no response. i wont buy anything from them again.